The SEMA Show is approaching! From October 30 to November 2, 2018 auto industry professionals from all over the world will converge on Las Vegas to attend the world’s largest auto accessories and tuning show, either as exhibitors or visitors. 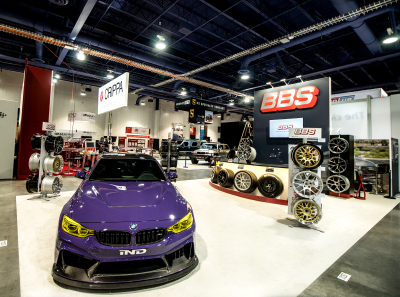 Premium wheel manufacturer BBS will once again be a leading exhibitor at SEMA where they will present the latest colour variations and finishes for the FI-R and LM forged alloy wheel designs. A key attraction for visitors to the BBS stand (Upper South Hall, Stand No. 32269) will be the spectacular street legal invocation of a Lamborghini Huracán Super Trofeo racecar. Based on a Lamborghini Huracán LP-580, the world's first Twin Turbo conversion for this car wears a Lamborghini Racing OEM widebody kit, and sits on a uniquely coloured set of BBS ultra-light forged FI-R wheels. This amazing car will be unveiled at 1100hrs on 30th October in front of automotive journalists from all over the world, and the BBS team is looking forward to welcoming trade visitors from all over the world to their stand. A BMW M5 (F90) was chosen to showcase the BBS LM forged wheel in the latest Bronze Finish. This car will be displayed in front of the Convention Centre (# V102) during the Show. There will not be much time for the BBS team to take a breather after SEMA. Their next stop will be the Essen Motor Show (November 30 to December 9, 2018) where they will engage with dealers and customers alike. Soon after that the company will close for its annual Christmas and New Year break before marketing activities ramp up again in 2019. BBS is the world's most highly regarded light-alloy wheel brand, a fact confirmed by awards from leading German and international automotive trade journals. Consistent quality at every stage of manufacture - from casting and forging to surface finishing, with a highly controlled temperature regime crucial to the strength of the aluminium - is a BBS hallmark. Only environmentally friendly paints are used in a process that guarantees OEM quality for premium vehicle manufacturers. For further information please check: www.bbs.com.